Twitter‘s powers always seem to grow in surprising ways, simultaneously via organic developments and third-party apps. 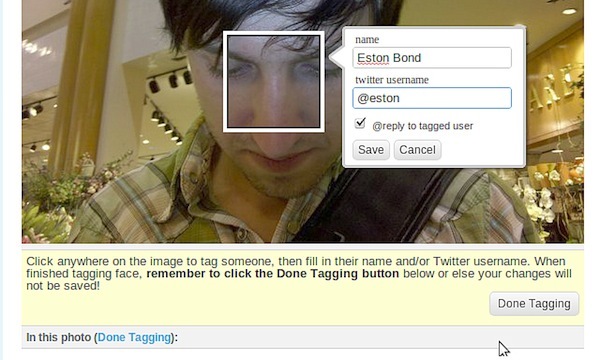 Like this latest one for example, a feature of Twitpic that helps Twitter rival Facebook: Face tagging. Twitpic’s system is completely familiar to anyone who’s ever tagged someone’s face in systems like Flickr or Facebook–you submit a picture of someone, then manually select the portion of the image that corresponds to the person. A little dialog box pops up, prompting you to enter their name, and then anyone who views the picture through Twitpic’s Web page will see that name when they mouse over the image. So far so groovy, but of course Twitpic is leveraging all of Twitter’s social networking powers, so that dialog box also lets you enter the Twitter ID of the “target.” You can then tweet out this activity, as well as choose to alert the person you’ve tagged that you’ve done so. This is all extremely similar to the way Facebook handles person tagging, but since it’s operating outside Twitter, and Twitter is by nature an open-transmit social network unlike Facebook’s traditional (but fast-eroding) “circle of friends” model, Twitpic’s system may actually be more powerful. Since Twitpic also recently added the ability to group photos into events, in combination with Twitter itself, Twitpic has emulated or exceeded some of the core functionality of Facebook. Since one of Facebook’s most frequently used functions is as a shared digital picture library, this is placing Twitter and its cloud of third-party apps as an increasingly serious competitor. There are three further tweaks that Twitter could deploy to make the photo tagging feature even more competitive. The first is to take Twitpic inside Twitter itself, as the company has done with other third-party apps–this would give it better control over the functionality and enable still tighter integration into Twitter’s systems. Next up would be to add face recognition tech. This is a long shot, but it would utterly transform the powers of the face tagging and turn Twitter into a serious social photo app. Finally, if Twitter added a third layer of communication to its two existing ones (to everyone who follows you, or a direct person-to-person message). This new layer could be called “Friends” and it would let you share stuff with just the group of people you used to consider “private” on Facebook.